In The Sack Of Westminster. What a legacy! 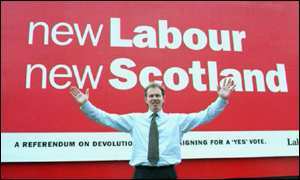 Not content with the Iraq genocidal fall out and the Afghan nightmare, still endless, our Tone and his band of nepotistic, self- interested, white van man ridiculing, pseudo socialists and lackeys to the Union thugs, all decided that to hold back the SNP tide, they needed to bribe the Scots with devolution. Now Sir Jeremy's poodle gives us this unfair settlement, wherebye yet another UK minority gets first call at the English teat. As the rump of the disintegrating British Government prattles its death knell noises, soon to be subsumed into Europe, all this crap, spouted today, is irrelevant. Who the lot of them think they're fooling is beyond me. Unless the UK gets back to a genuine Union and rids itself of all these squabbling, out of touch and quisling scum, the future of this Nation, once deserving of the title "Great Britain", is nought but strife, more grooming gangs, thugs and ever more uncontrolled immigration. However, given Labour might be swept away through all this, I really do need to fall back on this YouTube clip! Sir, I must take exception to your headline ‘Ferrets Going Berserk.’ Ferrets on the whole are gentle creatures and rarely become agitated if treated with respect and allowed to air there mustetlid proclivities. Tis true they have been known to pork down the odd native bird (who hasn’t) when provoked. But in my book Kiwis are much overrated. What can you say about a flightless avian? A very crap bird indeed. Furthermore, as I recall, ferrets only hunt when they want to and like politicians have never been known to fiddle there expense accounts. Although with regard to ferrets this may have something to do with the fact that they lack opposable thumbs and consequently can only grasp a writing implement with help. I hope this casts some illumination on this dark and much misunderstood topic. Dear FS, my apologies. Ferrets are delightful creatures, unlike politicians and many human beings. My justified admonishment reminds me of the proclivity for regarding bad behaviour in people, ISIS for one, as being like animals. In truth few animals, if any, ever can be compared negatively to humans.